Solo: A Star Wars Story opened to less than enthusiastic audiences, but the numbers are likely to improve the longer the movie spends in commercial theaters. 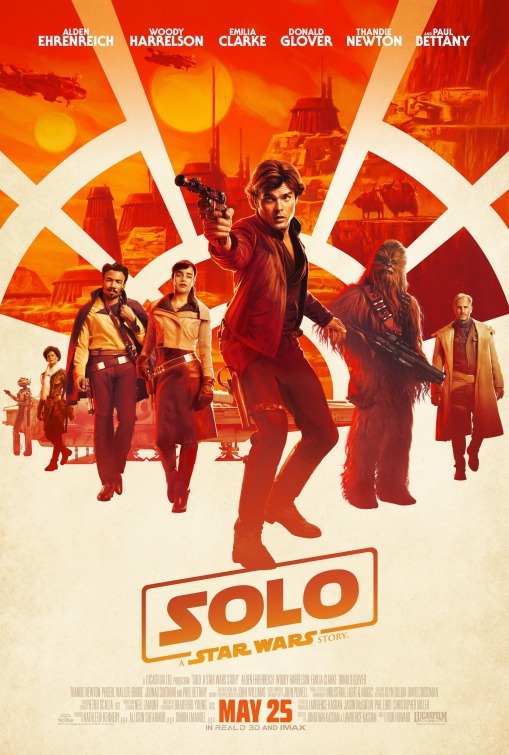 Director Ron Howard really shows his craftsmanship in putting the film together, making Solo a fun ride as a sci-fi action adventure. My full review with complete links can be found over at the Independent Institute’s blog here. The movie was billed as an “origin” story for the iconic space pirate Han Solo from the original trilogy. Solo, however, is best viewed in a more conventional light rather than an integrated part of the Star Wars canon. Viewers don’t really get a lot of new information about the real origins of the character, and Solo is just not bitter enough at the end of this one to believe he is the cold-stoned smuggler he plays in A New Hope (Episode IV). Moreover, Harrison Ford owns the character. Nevertheless, Alden Ehrenreich settles into the role well. The plot, which is grounded in his star-crossed love for Qi’ra is believable thanks to great acting by Emilia Clark of Game of Thrones fame. Audiences will empathize with most of the characters because the story gives each a soul. They just can’t be true to themselves because of the dark world in which they are forced survive. The film won’t earn academy awards, but it’s still a great way to spend a few hours in a movie theater over the summer. Based on my rubric, Solo: A Star Wars Story scored an 8.7 (rounded up), or a B+. The film didn’t break ground or push the artistic envelope. It also, in my opinion, give us a lot more insight into the character. A well crafted film, but not one taking it into the A range. For Rotten Tomatoes reviews and critical consensus, click here. This entry was posted in Film Reviews, Films, Independent Institute and tagged Han Solo, movie review, Ron Howard, science fiction, Solo, Solo movie, Star Wars on June 3, 2018 by SR Staley.